Trying to figure out how to start freelancing? Or maybe you’re already freelancing and want to take your game to the next level? This ultimate freelancer guide will give you everything you need to know to start a profitable freelance business! A freelancer is an independent contractor or temporary vendor. A freelancer may have one or many clients at one time. Typically a freelancer specializes in a specific line of work that the client may not need on a full-time basis. Popular niches for freelancers include, but are not limited to, Marketing, Lead Generation, Website Development, Graphic Design and Project Management. Making up 40% of all freelancers, this traditional group of freelancers works exclusively on a project-to-project basis. 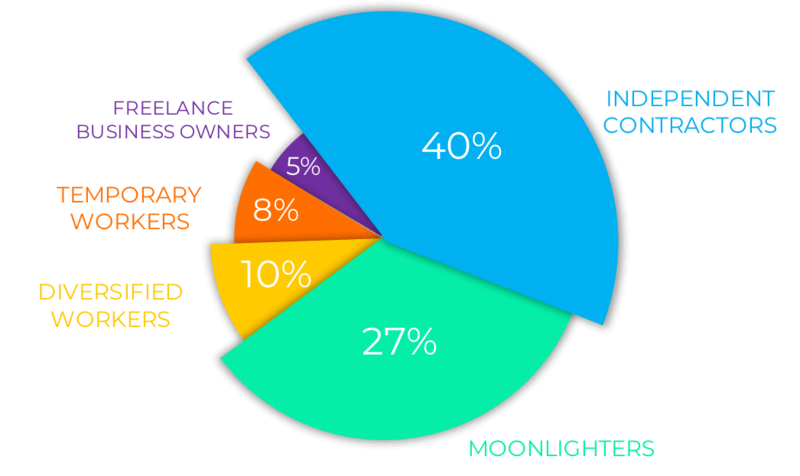 Comprising 27% of freelancers, moonlighters have full-time jobs and freelance after hours (by moonlight) to make extra income, or prepare to become a full-time freelancer. 8% of freelancers fall into this group. They may have multiple part-time or freelance roles that make up their entire income. This would include bloggers who freelance for side income, like people who drive for Uber and Lift. Constitute 10% of freelancers and take on projects for extended periods with a single client or employer, with the understanding it isn’t full-time or guaranteed employment. The smallest group of freelancers at only 5%, this group has grown a team that contributes to their overall freelancing business. Many new freelancers struggle with friends, family, and professional connections asking them when they plan to find a full-time job. If you’ve never freelanced or had a close friend or family member work as a freelancer, it can be hard to understand that it is entirely possible to make a six-figure plus salary as a freelancer. Sometimes, if you’re really diligent about your rates and the types of clients you work with, you can earn a six-figure salary working less than full-time. In fact, the number of people earning their living from freelancing has been increasing rapidly and is expected to eclipse the number of people earning their income from full-time employment by 2027. Let’s look at some other important statistics and trends aspiring freelancers should know. As with any line of work, there are pros and cons of being a freelancer. Let’s delve into those now. The most appealing aspects of freelancing for most freelancers are flexibility and freedom. Freelancers have the ability to set their own schedules. Are you a night owl? Wish you could sleep in and start work at noon? As a freelancer, you have the ultimate flexibility to set your schedule. You simply tell your clients you have time for meetings after noon. Want to be able to leave work mid-afternoon to pick up your kids from school and help them with their homework? As a freelancer, it’s a non-issue. Again, you just tell your clients you’re not available during said window of time. Most traditional employers would not be able to accommodate such a variance in schedules due to the nature of collaboration among large groups of teams and required to deliver their products and services. But when you have a valuable, and necessary skill for the business, as just one freelancer they can be more accommodating. As a freelancer, you get to decide which clients you’ll take on. Don’t like working with super-serious people? Or don’t like to work with people who are super talkative? You don’t have to take on those clients. You also make the decision on what types of projects to take on. Are you a graphic designer, but you hate working with iconography? You don’t have to do that work. You can either refer the client to another freelancer or outsource the work yourself. Ultimately, you pick the types of projects that you want to work on. And, you determine your rates. You don’t have to ask for a raise from your boss. You want a raise? Increase your rates. You’ll just need to be prepared to demonstrate the value of your freelance services to prospective clients. We’ll talk about how to do that later. As if that’s not enough, as a freelancer, you also set the strategic direction for your business. You can work on passion projects that advance your long-term strategy and interests – without regard for your employer’s strategic objectives. If you believe there are methods to find new clients using, say, Periscope, you can work to implement that strategy without having to get approval from the boss man/woman. One of the disadvantages of being a freelancer is that you don’t get paid vacation time. If you’re not working, you’re not getting paid. Of course, this can be overcome by simply building your time off into your rates, in the same way that a full-time employer effectively would. We’ll get into that in more detail when we calculate your rates. Because they are self-employed, freelancers don’t have an employer to pay for their healthcare coverage. If you don’t have access to a healthcare plan through your spouse or partner, you may have to source your own insurance. Here are a few places you may want to begin your healthcare search. The Department of Health and Human Services reported that the average American pays $106/month after subsidies. Obviously total costs will vary depending on the size of your family, the state you’re in, and the appropriate level of coverage you need. If you have a highly collaborative nature and love interacting with others, you may not like the the solopreneur, work-from-home, freelancer lifestyle. If you find yourself in this situation, you can find ways to increase your human interaction. For instance, you can rent a desk at a local collaborative office space like WeWork. If you don’t need to be surrounding by people all the time, you may just need to make an effort to find and attend local networking opportunities in your niche. Or you may join private Facebook groups and network with other freelancers online. Join the Freelancer Foundry Facebook Group! And, since you set your schedule, you may find yourself having lunches, coffees, and drinks with your friends more than you ever had time for in your full-time role. Unfortunately, unlike a traditional employee, you can’t just wait for someone to give you a project, do a great job, and wait for the next assignment. Marketing: You need to have a solid marketing and branding plan that indicates you are a real, viable, professional freelancer. Lead Generation: You need to have a plan to get new clients via email marketing, advertising, social media, referrals or freelancer websites. Sales: You need to know how to close the sale once you’ve gotten a meeting with a client. Client Success: You need to effectively manage the project, communicate deadlines and requirements with the client to ensure they are satisfied with the final deliverable and with you. Finance: You need to keep track of your income and expenses so that you can properly do your taxes, know when you can afford to take your vacations, and where you may be able to invest in your business. To be successful as a freelancer, you need to have a plan to manage tasks in all of these areas to ensure that your business runs successfully and continuously. When you start freelancing, you’ll need to decide what services you’ll be selling to your clients. For some that may be very obvious: if you’re already a highly specialized mobile app developer, you’ll probably provide those services to your clients. However, if you’ve been in various Marketing roles and have a variety of skills to offer, you’ll have to figure out which niche you want to focus in on as a freelancer: graphic design, social media management, lead generation, email marketing, etc. And, then you’ll want to keep “niching” down to find a more specific segment of the market that you can provide services for. For instance, when I started freelancing, I was doing a wide range of graphic design and web design work. Shopify sites, WordPress sites, and changing fabric on curtains (for reals). But I wasn’t an expert at anything so it took me too much of my time to achieve the end result, and I consequently made less money than I could if I’d focused on one area. Then, I discovered a specific market that I could target, charge more, do the work quickly and that clients RAVED about. I became a freelancer that specialized in… dun…dun….DUN….PowerPoint design. Not keynote or Slides – just PowerPoint. I rebranded as a PowerPoint expert and started landing bigger projects, at a higher rate. But, the funny thing was, the presentation was the entry point for those clients. Once they figured out I had a good design sense and was reliable, they would start to call me for business card design, social media graphics, banner stands, website revisions, etc. The problem then became SAYING no!!! Good problem to have in freelancing…. There are so many articles out there that publish freelancer rates – all of which seemed low to me. I took the liberty of researching the hourly rates for Top Rated Freelancers in Upwork by category. Obviously these ranges are rather wide. What every freelancer will tell you is that they do the same amount of work at $30/hour that they do for $100/hour. But at $100/hour their experience is better because they are working with quality clients. If you’re just starting out as a freelancer and have no social proof, you should expect your projects to start on the low end of the range and you can increase your rate with each successful project. This will allow you to build a solid portfolio or case studies to use for social proof, with the ultimate goal of building trust with prospective clients. You can continue to inch your rates up over a few months and reach the higher levels. This also allows you to build up your confidence that clients are still happy with the work that you produce at those rates, so you’re more confident asking for higher rates- and KNOWING you’re worth it! Getting your first client will be one of the largest obstacles you face in your freelancing journey. In the early stages, you’re more susceptible to being easily discouraged, increasing the likelihood that you give up on being a freelancer entirely. When you go into it knowing it will be more difficult because you don’t have a portfolio and social proof, you can anchor yourself in your long-term goals and be more resilient in the face of challenges all freelancers face. Of course, many begin their freelance journey by moonlighting. Since many employers will have a clause in their employee handbook forbidding you from having other employment, you may need to be more discreet within your network when you get started. There are a plethora of online freelancing platforms that connect freelancers with prospective clients. You’ll likely see many articles and advice that you should not use these platforms because they reduce your services to a commodity and force you to compete on price. I simply have not found that to be true. I think these platforms are a great way to get started quickly, build up a portfolio and base of client testimonials. These platforms don’t require that you build your own website, have to learn how to cold email, advertise, etc. They have a client who needs a service now – and you have a service to offer! Connection made. One of the biggest criticisms of these freelancer platforms is that they make money by taking up to 20% of the total project costs. For those of you with business savvy, you’ll immediately recognize that this isn’t a bad deal. Many of these platforms have invested and organically built up first page Google search results, in addition to investing in pay-per-click advertising. These sites have a ready, paying audience that you need to tap into. Could you do it yourself without having to pay 20%? Sure… you’ll just have to invest 6 months in building your website and learning and implementing SEO strategies, digital advertising strategies, cold outreach, etc. Quick tip: Want to see which freelancer platforms are dominating in your niche? Do a google search for a term that your ideal client would search for when looking for you. Example: if you’re a project manager, your ideal client might search the term “hire a project management expert.” You’ll be able to see which platforms are getting that organic traffic and those which pay-per-click (PPC). Those PPC costs are high, so you can rest assured if the platform is paying for those ads, they are getting a return on that investment – meaning your clients are clicking and hiring there. Here is the ultimate list of freelancer websites you may want to consider. This list is sorted by traffic volume in descending order (highest traffic volume first). It is advisable to have some basic structure of what times you will work and when at the beginning of your freelance journey. Here’s why: if you don’t have a portfolio, social proof, and client base built up yet, it will take effort to do all those things. By not being intentional with your time in the beginning, it can be very easy to do almost no work and not get the results you expect. If you’re moonlighting, you’ll burn out fast. If you’ve quit your job and are dipping into savings, you’ll blow through it quickly. What you really want to do is set yourself up for success as a freelancer. That probably means keeping something comparable to business hours for your efforts – that’s when your prospective clients will likely be looking for you, or receptive to a communique. But, wait! I thought you said that being a freelancer was all about the flexibility? I don’t want a schedule! I know, I know. But in the early phases you need to balance laying a solid foundation with massive flexibility. In addition to creating a semblance of a schedule, you’re going to want to get your workspace situated. In the first few months, you may not be ready to commit to the rent of a shared office space like WeWork. If you’re going to be working from home, you’ll want to have a quiet, organized, comfortable place to work. You may decide to repurpose your dining room or furnish a new office. Maybe you like the background noise and plan to go to Starbucks everyday. Whatever you decide, make sure you’re comfortable working in that space so that you don’t ditch work! Your brand and marketing will also dictate how much you can charge as a freelancer. For example, if you’re reaching out to clients, you inherently have less value to them than if they reach out to you. And if they find you, and perceive you’re an authority, they’ll be more confident in hiring you. When you can build up a pipeline of clients coming to you, you can be more selective in who you decide to work with and feel more confident in charging higher rates. So let’s break your Marketing efforts down. Your brand is what your prospective clients think about your freelancer skills based on your graphics, copy, social media, portfolio, etc. Your brand, at the very least, should be exuding the services you provide and the value those services create. Beyond that, it should indicate your personality and style. Are you super fun and cheeky? Or maybe you’re really conservative? Whoever you are should be reflected in all of your marketing efforts. This will help you attract your dream clients and repel the clients who won’t like working with you. This can be intimidating at first, but you’re better off getting something out there than nothing at all. Give yourself a deadline to produce your freelancer brand and associated content to make sure you’ve got the essentials to demonstrate your expertise – even if it’s not perfect. You’ll realize where you need to make adjustments and can do those as you get your freelance career off the ground. You can use sites like DesignCrowd to crowdsource a logo design relatively inexpensively. Or you can search pre-made logos on a site like Shutterstock. If you’ve got design chops, you can also create your own logo. Be forewarned, you could easily fall down this rabbit hole and spend more time on your brand than on building your freelance business. Get it good enough and you can iterate as you go! Instead, we need to really think about what our CLIENTS want and need. You can break through the noise and stand out from the competition by indicating that you 1) understand the client’s problem and 2) have experience solving that problem. This creates trust with a prospective client, which is really important. Especially in cold outreach or digital introductions, clients always have the fear that they are going to pay a freelancer who bails, or one who poorly completes the job. By indicating that you understand their problem and have solved it before, it creates trust. You can continue to build on that trust with your portfolio and client testimonials. You will want to have a portfolio that is aesthetically pleasing. To align with your brand, you should include this portfolio on your own website. To convey your stability and commitment to your clients, I recommend having a portfolio on your own domain, as opposed to using Dribble or other portfolio sites. Each item in your portfolio should then describe the client’s problem, your strategy and approach to solve it, your execution, and the results of your work. You should also ask that client for a testimonial or review of you and your work for your portfolio. That testimonial should include a picture of the client and a link to his/her website or LinkedIn profile. For prospective clients viewing your portfolio for the first time, this helps build social proof that other clients have worked with you and been happy with the results. In a world where you may not always have a personal relationship or warm intro to a prospective client, building trust by any means necessary is essential. After you’ve addressed what the client wants and needs, you can talk about YOU. And not before. I’m sure you’re great. Really. But the client doesn’t care about YOU until they know YOU are the freelancer they need to hire to do the job because YOU know exactly what you’re doing. You’ll start with a headshot. Ideally, a professional headshot. Again, this shows stability and means to have a professional headshot taken. Selfies with unicorn horns, filters, etc. Dark photos that look unprofessional or blurry. If you’re unsure which photo to use, you can go to photofeeler.com and have your photo rated based on attributes like competency and likability. You continue to build trust with your prospective client in the about you section of your site. You’ll want to tell them why you’re passionate about the work that you do, what your qualifications are, and why you’re a freelancer. This is a section for you to really let your personality shine through. Try not to be stale or unnatural. Make them feel comfortable reaching out to you! Quick tip: A trick here is to write all your copy and walk away from it. Come back a day later with fresh eyes and read your content out loud. Does it sound natural? Would you actually communicate with someone that way? If not, try again. It gets easier as you go – I promise! This is going to seem obvious, but make sure to put your contact information on your website and make sure that it’s highly visible. A button on your header navigation or a secondary top navigation in a noticeable (but on brand!) color will do. Give them options they are going to be comfortable with and make it easy for them to reach out. Quick tip: If you put a space on either side of the @ symbol in your email address the internet robots won’t email it! You could start a blog that educates clients about the best practices in your niche. You could also include posts on how to have successful client engagements, or how clients should select a freelancer in this niche. You could write an ebook about best practices in your niche. Anyone who has enough opinions and stamina to write a book must be make a good freelancer, right? You can apply for awards in your niche. You can be part of professional networks in your niche, and potentially speak or sit on panels at the networks’ events. Participate in discussions and community in your niche – Facebook groups, Twitter convos, or podcasts. This may sound overwhelming, but you’ll just pick one thing to do at a time! Your freelancer brand should also be consistent and visible in the following areas. Your imagery should have a consistent theme, style and colors. Your logo should be customized for each location, but still be identifiable as part of your brand. If you’re using Upwork, Freelancer or any of the other freelancer networks, you should make sure that your headshot matches the one on your website – so people know they’re looking at the correct profile/website! Again, your description of services should not be about you. It should be about what the client wants and needs and how you can deliver those results. If you have a long logo, you should make sure that you create a version that will fit well in the square social media profile images, while still being recognizable. If you’re going with your name as your personal brand, go ahead and use your profile picture on your social media channels to make it more personal and so that the client knows you’re the right freelancer. You can link to your portfolio examples and testimonials from your social media channels. You can also share interesting articles or memes related to your line of work that your clients would be interested in. This is more of an opportunity to build trust by indicating you 1) are continuously involved in your space and 2) that you are a real live human being putting effort into their business. Use the same fonts, colors and logo in your proposals and contracts that you use on your website to create consistency and a professional look. It’s a good idea to have at least 50 business cards, even if you’re finding most of your clients digitally. I know. It feels old-school. But you’d be surprised how many times you’ll be out at dinner or a networking event and someone finds out what you do and says they are interested in your services. It’s best to be able to convey your professionalism and stability by having a business card with your contact information on it. Once you’ve got your brand established, you have multiple ways to find and get new clients. The contract goes through Upwork and your payments are escrowed (the client pays the money to upwork, and when the project is completed, upwork releases the funds to you). This keeps you from having to deal with accounts receivable. Upwork and other Freelancing sites that the work you’re doing is already publicly listed and can usually be used in your portfolio (you should still ask for permission to be on the safe side! Upwork asks you and the client to review each other, which become public reviews. This creates legitimacy in your portfolio (clients know you didn’t just make up your testimonials) and you don’t have to ask for the review.I’ve already established that while some freelancers vehemently disagree about using freelancer networks like Upwork, I’ve found it to have the lowest barrier to entry and the fastest way to build up your portfolio and reviews, as discussed above. Quick tip: as long as the client likes you, you’ll likely get a high review. Even if the work wasn’t perfect, if they like you they won’t want to hurt your freelancer reviews, so they’ll likely give you a high rating, they just might not hire you again. That doesn’t mean you shouldn’t do quality work, but it is something to keep in mind! Cold outreach means sending an email or calling someone you don’t know to pitch your services. While cold outreach is a great way to market, it does take some upfront knowledge and technical skills to get up and running. The volume of outreach needed to secure a client is also very high. For example, you’ll need to send 100 emails to get about 5 responses. From those, maybe you only close 2-3 clients. The more effort you put into customizing each pitch, the higher your returns will be, but it’s still a lot of work. You’ll need to start by determining how to find your ideal companies, the ideal contacts within those companies and how to pitch them (like your website, they don’t care about you until they know you can help them). Unlike your website, they weren’t looking for you, so you’ve got to be brief and clearly articulate your value. You can’t do cold email outreach via Mailchimp because it’s against their terms of service. There are tools like Woodpecker that will connect to your gmail account and drip out emails so you don’t have to send them one at a time on a daily basis. Instead, you could dedicate a day a month to researching contact info, writing emails and scheduling them to go out. Then, that’s only one day a month you need to be disciplined instead of 20 minutes every day. If you’re going to use cold outreach as your preferred method of getting new clients you HAVE to be diligent about sending out the emails so that you have enough new clients coming in to meet your income goals. If your target audience is on Facebook, you could try your hand at Facebook Advertising to see if you can find those clients at a reasonable cost per lead. SEO and Google is the holy grail of finding clients. When a client goes to google to search for “hire a graphic designer” and your site pops up, the client automatically considers you an authority. As long as they go to your website and continue to be impressed, you have the upper hand. They want to work with you, the authoritative freelancer with the great client reviews. They will reach out and look to your expertise to set rates, run the project, etc. SEO is a long process (though not as long as it used to be) and there are ways to build your site from the beginning that sets you up for long-term success in getting traffic from search engines. If you have an interest in social media, you may find organic social media marketing to be the best source of new clients. You can participate in groups related to your niche (where your ideal clients will be) or create a blog and share your sentiments and best practices via those channels. Long-term, it will become easier to get new clients via referrals from your existing clients. Within 6 months, I was getting 80% of my business from existing clients on Upwork and clients they had referred me to outside of Upwork. This is great, because you don’t have to pay Upwork the 20% of the total project cost when you didn’t meet the client directly on Upwork. And, as clients spend more money working with you, the fee to Upwork continues to go down, making it more economical for you. You never know who you’re working with or who they know: I had one client who reminded me of an old boss of mine – he was such a passionate entrepreneur and I wanted to help him make his dream a reality, so I took on the project for WAY less than I should have. It was a great experience for him and he referred me to a group of consultants he used to work with and told them my rate was 3x what he actually paid, but worth every dollar. Ultimately, there are a number of way to get clients as a freelancer. Having a diversified source is important so that if, for instance, Google has an algorithm change and your rankings drop, you still have another source of clients. Now, once you’ve gotten leads, you gotta know how to close the deal and get that client! Many freelancers set their rates on an hourly basis. They’ll set their rates by looking up the average annual salary of a full-time employee and dividing it by 52 weeks and 40 hours/week. But this method is fundamentally flawed. From a holistic business perspective, the salary of the employee delivering the service is only one cost of the total cost to deliver a service. Other costs include sales, marketing, finance, managerial overhead, office space, health insurance, etc. As a freelancer, you are taking on all the responsibilities and expenses that the employer previously paid in total, so you should be billing your clients what the employers’ clients were paying. The advantage for the clients of freelancers is that they do not have work for a full-time resource. They don’t mind paying more per hour for a freelancer because it’s still much less than the expense of hiring even a part-time employee. Still on the fence? Did you know many firms will pay a recruiter a $5,000 fee just to source successful entry-level candidates? Or that executive candidates in large companies go through an interview with a consultant that will cost the company as much as $20,000 for a day? There are two shifts you need to make here: 1) these companies pay these fees because the services provide value to them and 2) companies inherently operate with larger dollar numbers than individuals. They make more money and they spend more money. As you make the shift from employee to freelancer and business owner, you need to reframe your perspective on the value of the services you create and the commensurate compensation. Again, you’ll start on the lower end and work your way up. This isn’t necessary if you’re confident in your services and rate, and have enough social proof. However, if you feel even a little unconfident, it can be a great way to go to build up your confidence with your rates. If you start at charging $100/hr but aren’t confident clients won’t buy and you may think it’s because they’re not willing to pay that price (because that’s what they’ll tell you) but it’s really they aren’t willing to pay that price for you. The way most freelancers ruin sales conversations is by believing they need to come in and sell their qualifications or process. First and foremost, be a person! Don’t let the pressure of the sales conversation keep you from being you. Be friendly, ask how the client’s weekend was, etc. After a few minutes you’ll settle into the conversation naturally. What you really want to do is understand the client’s pain points, ask lots of questions and take notes on exactly how you are going to help them. The meeting should be 80% understanding how you can help them and 20% telling them how you’re going to help them. Why are they looking for this help? Why haven’t they been able to do the work in-house? What do they expect the biggest challenge will be? Are there other decision makers that will be in the process? Is there a timeline for project start and end? If it’s a highly technical sale, you’ll want to ask about their existing infrastructure so that you know if you have the skills necessary to successfully help them. The most efficient approach I’ve found in your specific situation is…. (and outline the process for them in detail). I completed a similar project for a previous client and it took 3 weeks and since the client has achieved these great results… Is this timeline realistic for you? Challenges that have come up in this situation include:…. do you think those would be a challenge for you? Quick tip: don’t be afraid to say no to a project if you’re not qualified for it. You’ll end up spending too much time working on it, probably with a suboptimal experience for the client. Which will cause you to earn less and hurt your reputation. Resist the temptation to take any ‘ole job as a freelancer!!! Just like your branding, your proposal needs to be very clear that you understand the clients problems and exactly how you will solve those problems, the timeline, and other terms to clarify the relationship: will there be touchpoint? If one or both parties decide it’s not a good fit what happens? Do you not get paid at all? Do you get paid half? Is there a non-disclosure clause (you can’t use the work in your portfolio or talk about it at all)? A lot of people will overcomplicate the proposal process, but it really is that simple. Quick Tip: Especially when you’re just getting started, you may not have a tight process for understanding all the potential complications upfront and may underquote a project. In such cases, I have always eaten that expense and considered it an investment in learning and improving the efficiency of my process. When you make the client, who assumed you were the expert, participate in that burden, they may become dissatisfied with you. It’s worth it to them to have trust in you and be willing to be a referral. The old adage about not burning bridges is still true. Especially if you’re in a small niche. As I mentioned, I send my proposals right out of Freshbooks, so I have all of my documentation in one place, and the client can sign it, becoming the contract too. Non-disclosure: can either of you discuss that you’re working together on this project? Can the work go into your portfolio? Is the client willing to give a testimonial? Contract termination: If one or both parties decide to end the contract early, what type of payment is made to the freelancer? You don’t want to be out of pocket for the project entirely, especially if you’re not culpable for the project ending (sometimes priorities change, but that shouldn’t be your burden to bear alone). Payment terms: Will there be a down payment up front to protect the freelancer? Will there be periodic milestones? Will you bill hourly and submit invoices semi-monthly, monthly or at the end of the project? Many people beginning their careers as a freelancers don’t have a few thousand dollars to spend on having an attorney review their contracts. At the end of the day, most of your clients are good people and will want to do the right thing by you. You need to decide the ROI on spending the money on a contract. For instance, if your projects are $50k in one month, you probably want to have a pretty ironclad contract to protect yourself. But if you’re doing lots of $500 projects that take 2-3 days to complete, it’s probably not worth it to have an ironclad contract, because the expense of enforcing it legally is worth more than the work. Quick tip: As frustrating as it might be, don’t let a legal battle over something trivial interrupt your freelancing journey. Every now and again you’ll find some shady person who’s trying to take advantage of you. If alarm bells go off early in the process, learn to walk away. And don’t let the few bad apples that get by you interrupt your trust in others. It’s just good business administration. Make the best decision for your business instead of hurting your business (by spending your time and energy fighting a legal battle instead of earning great clients) in service of your principles. Now that you’ve secured the client, you should consider how you ensure the project is a success. Depending upon how intensive the project is and your proposal process was, you may want to consider a kickoff meeting or call to discuss expectations. Who is responsible for each part of the project, what are the deadlines for each deliverable, how will you communicate challenges and progress to each other? This step may be wholly unnecessary if you have a smaller project, involving only a few people for a short period of time, and you already set those expectations in a sales conversation. If in doubt, over communicate. Just because you have flexibility as a freelancer doesn’t mean that you can push off deadlines. Clients have needs and timelines – and missing those can have a cascading effect on their business. You don’t want to be the source of the cascade! The client hired you because you made promises to them and you should do everything in your power to honor those deadlines. Especially in the beginning, it’s best to underpromise and over deliver. This leads to a better client experience and gives you a buffer if you hit a speed bump and need to use it. When faced with a challenge or bad news they need to communicate, many freelancers will delay telling the client. This is actually the wrong approach. If the project is at risk for any reason, you need to tell the client what the problem is, what you’re doing to resolve it, and the timeline in which you should know the full impact on the final project timeline. Again, the client has other needs and deliverables that flow from your deliverable, so if it is in any way in jeopardy, they want to know ASAP. This allows the client to trust that the freelancer has their success in mind. You can never communicate enough. If you end up communicating too often, the client will likely tell you they don’t need updates so frequently. The worst thing you can do, especially on your first project with a client is take a down payment and then go MIA. Remember, the client is nervous about hiring a freelancer for the first time. Are you the real deal? Or are you a scammer disguised as a freelancer? Everything you can do to build trust with them will build up long-term relationship equity. Remember the old adage, the client is always right? Yeah. They are. Execution of that can be tricky. As a freelance presentation designer, if a client wants something ugly, I will deliver it. I’ll give them alternatives and explain the best practices – but at the end of the day, if they are not happy and proud of the deck I create, they will underperform in their presentation. I take the stance that I’ll advise and give options, but I’m not in their shoes day-to-day. So if they think they need really detailed, hard to read charts, I have to give them the benefit of the doubt. Now, I had a friend who was a full-stack developer, and he frequently ran into the issue where a client would think they knew more about the technology than he did. His approach was not to tell them that they were wrong – but to try to understand their perspective. Sometimes clients know what they’re talking about but use the wrong terminology. Seek to understand and resolve. If a conflict is unavoidable, you shouldn’t tell the client he/she is an idiot and quit. You should tell them you have concerns because in your experience x, y, z. Find out their concerns and work to solve the problem together. Sometimes, but hopefully not often, as a freelancer you’ll find yourself in an unresolvable situation. What happens if you’ve got a bad client who doesn’t respect you, doesn’t let you do your job, and thinks they know it all? For example, if you’re freelancing as a network engineer, and the client wants you to do something you know will compromise the integrity of the network. Do you do it just because “the client is always right?” What if their network gets breached and they come back and try to sue you? In such situations where there is an unresolvable conflict and in good faith you cannot complete the work, I would recommend gracefully telling the client that you don’t believe that you are a good fit for their project and you’d like to discuss executing the early termination clause in the contract. If the client is highly irritable and well-networked, I would do everything in my power to end the relationship on good terms. You do not want your reputation as a freelancer being besmirched by a know-it-all with a bad attitude. As a freelancer, getting feedback and reviews is crucial to your success. You’re meeting so many new clients on a regular basis and you need to be able to convey that you are trustworthy and reputable. The easiest way to do this is to ask for reviews. I would recommend asking the client to pick the social network/platform of their choice to provide a review of your freelance work and you, as a freelancer. This will start to build up your reviews on a variety of platforms and be easier for new clients to find you on their preferred channels. And, you can always take these reviews from the public sites and add them to your website! Whereas, you can’t take them from email/your website and put them on the social sites. We’ve already discussed your rate but there are many other finance considerations for freelancers. What is the basic, most barebones amount of money you need to live on each month? To pay your rent or mortgage, car payment, insurance, food, and miscellaneous expenses? Now take that number and multiply it by 1.2. This will increase the amount you need to cover your tax liability as a freelancer. You’ll also want to determine what you’d ideally like to make or “take home” each month as a freelancer. This will include vacations, a new car, and savings. You’ll also take that number and multiply it by 1.2 to cover your tax liability. Now you’re also going to take both the minimum amount and the ideal amount and divide them by 30* hours per week and 4 weeks (roughly) per month to get to your hourly rate range. *Because you have to take on other responsibilities like sales, marketing and finance, if you want to work a 40-hour week as a freelancer, not all of that time can be billable time. This number can be adjusted as you see fit. First, you need to ensure that the minimum hourly rate is being met in order to reach your minimum financial obligations, and ensure a career as a freelancer is viable for you. Next, you’ll need to keep track of your efforts to get clients so that you can throttle those efforts to meet your goal. As an example, let’s say for every 100 cold emails you send, you get 5 replies (leads) and are able to convert 2 of those leads to freelance clients. You know you need 6 new clients every month to reach your financial goals, then you know you need to be diligently sending 300 emails per month to find those 6 new clients. Here’s another example: let’s say you generate leads from Facebook ads. 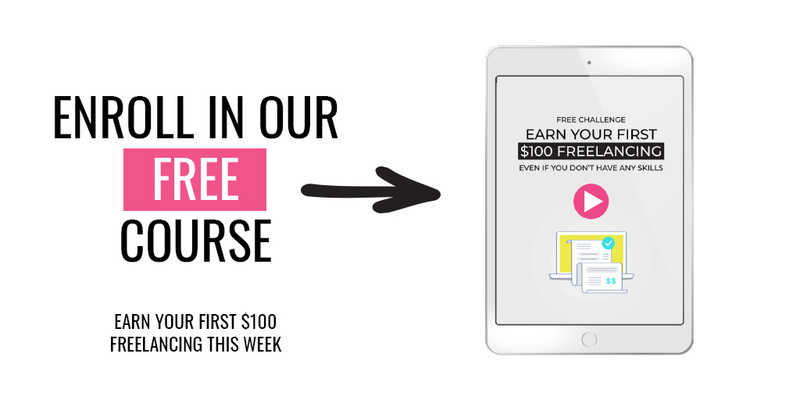 You’re able to determine that it will cost you $10 per lead. But you’re able to close 3/5 leads via Facebook. If you still need to get 6 new clients every month, then you need to spend $100 on Facebook ads to get 6 new clients. Once you understand these metrics, you can determine how and when to “turn on the faucet” of leads when you need them. Another metric you need to understand as a freelancer is how long it takes you to take a lead to a closed client and then a completed project. This timeframe is called days to revenue and it’s very important. If it takes you one week to find a lead and finish a project, then you can turn on your faucet and revenue more easily. However, if your days to revenue is 2 months because you have a longer project cycle, you must be far more diligent about consistently generating leads because if your projects dry up it will take you two months to get more money in your account. As a self-employed freelancer, you’ll need to pay your income taxes (as opposed to when you’re a W-2 employee and your employer pays them). So, you need to carve out 20% of your paycheck for that (maybe more depending on your tax bracket). You’ll also be responsible for the employer taxes of 15.3% that your former employer paid and you probably never knew about. Now you’re considered both the employer and the employee so you’ll pay both sides. Obviously this is not ideal, but it is exactly why you should be basing your rates based on an employers’ rates instead of the employees’ salary rate. Because freelancers are the employer and the employee, freelancers are responsible for quarterly tax payments in the same way that your full-time employer was. To find out if you need to file quarterly taxes check out this article from the IRS. You should be carving this amount out of every payment you receive and put it in savings for tax time. As a freelancer, you have reasonable expenses that you can deduct because you’re considered self-employed. For instance, if you have dedicated space for your office you can deduct a portion of your rent on your taxes. A general rule of thumb on deductions is, if you would have incurred the expense even if you weren’t self-employed, it’s not deductible. Any tools or expenses that you incur as a freelancer like software, hardware, classes, and meals with clients are deductible. You’ll make your life a lot easier if you take the time to keep up with these expenses as you go, instead of trying to track them all down. Without reservation, I recommend FreshBooks, which you can use to manage your proposals, contracts, invoices, expenses, and hours worked on each project, in addition to receiving electronic payments from clients. You can get started with FreshBooks with a free trial. If you’re working on an hourly basis you need to accurately track your hours so that clients know how much time you spent working on their project. If you’re being paid on a project basis, I would still recommend keeping track of your hours to ensure you are appropriately pricing projects. Quick Tip: When providing estimates, always double the number of hours you think the project will take. We have a tendency to underestimate how much work goes into a project. It’s better for a client to be pleasantly surprised at the end when you come in under budget than by being WAY over budget. One of the things I love about FreshBooks is that it reminds me that a client hasn’t paid. It will send reminders to the client automatically and provide a link for me to send to the client in a personal email if I need to follow-up. If you’re diligent about the clients you take on, it will hopefully be rare to have a client that doesn’t pay on time. In the event that you have a client who fails to pay, you should obviously follow-up one-on-one several times first. If it’s a big enough bill, it may even be worth it to send the invoice to a collections agency and they’ll continue to follow up with the client to get payment. If they receive it, they earn a commission from you as a percent of the payment recovered. So, if you’re in a situation where you doubt you’ll get paid, it’s advantageous to send it to collections so you don’t spend anymore time on it. As you get started on your freelancing journey or decide to level up, you’ll likely encounter speed bumps. Here are some ways to stay resilient and committed to the journey. Whether you are want to be a freelancer to create the flexibility to travel the world, to spend more time with your family or escape the corporate bureacracy, you need to be very clear about what your goals are in pursuing the journey. Like any journey, there will be good days and bad. By anchoring in your long-term goals, you’ll be able to find the resilience to persevere during the short-term setbacks. While you may start by charging lower rates to build up your portfolio and client base, it’s essential that you have a plan to slowly increase your rates and get to your ideal income goals. Of course, this isn’t always easy — and there will be clients who will tell you it’s not worth it. And, that’s fine. If it’s not worth it to them, it will be worth it to someone else. When you compromise on your rates, you create a situation where you’re too busy to take on the right clients, who are willing to pay you a competitive amount, when they come along. When in doubt, remember that you have the skills and expertise the client needs. They may be able to find someone who is less expensive, but they might not get such a high quality of work. In the early months, you will learn a lot about the types of projects you enjoy and the types of clients you enjoy working with. As you identify those projects and clients, continue to tweak your marketing and branding to attract those clients who need help with those specific projects. Find local freelancer meet ups or freelancer groups you can join to collaborate and share best practices with freelancers in your niche and outside of it. Interested in joining the Freelancer Foundry Facebook group? Click here to join! A mentor who has a process or roadmap you can follow to get all facets of your business running smoothly over a period of time. Not everyone is meant to be a freelancer. But if you really want the freedom and flexibility it affords, you now have everything you need to know to get started and be successful!